Coronado can be reached by a short 15 minute ferry ride from San Diego or a nice scenic drive over the Coronado Bay Bridge, which is just over 2 miles long. Coronado has a lovely small town feel, some fantastic beaches and that all important SoCal sunshine! Taking the ferry over from San Diego is a great option; you can hire bikes from the ferry landing and cycle to the beach from here. There are some nice little shops at the market place by the ferry landing, perfect for purchasing those all important souvenirs from your beach holiday. The views looking back across the water of downtown San Diego are fantastic. Coronado Beach is split into sections, with its miles of stunning shoreline it is no surprise it was named as one of the top family beaches in Travel Channel’s best beach award in 2012. Central beach is perfect for family holidays and is patrolled by lifeguards. Here you can swim, body board, paddleboard and play volleyball on the beach. Seaforth Boat Rentals near Hotel Del Coronado hire out stand up paddleboards, kayaks and pedal boats. They also run day trips such as sailing, fishing, wakeboarding lessons and jet ski hire. At low tide the rock pools on the beach are great for exploring with a fishing net. On that note if you like fishing, either Central Beach or the ferry landing pier are good places to cast out a rod. 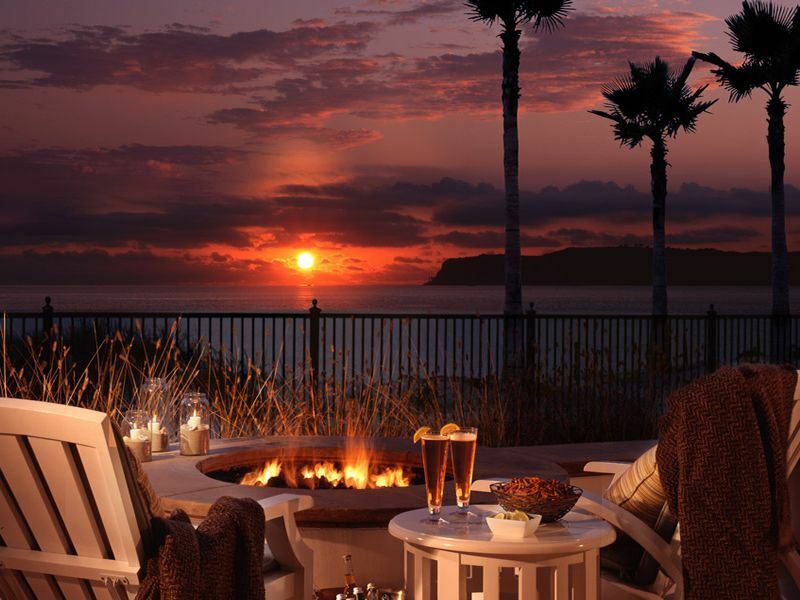 The very grand Hotel Del Coronado can be found right on Central Beach. It is worth heading to for a cocktail on their sundeck after a day of sunbathing. Sit back and watch as pelicans gracefully zoom at low levels across the ocean. The film ‘Some Like It Hot’ with Marilyn Monroe was filmed here and Katherine Hepburn and Charlie Chaplin are also rumoured to have stayed at the hotel. North Beach or Dog Beach as it is known is the only dog friendly beach on Coronado. This beach is good for surfing and has fire rings for barbeques and S’mores, what a great way to end the day! If you want to learn to surf while you are here the Coronado Surfing Academy offers a range of lessons. There is a Naval base situated at the far end of North beach, it is great for viewing the occasional military aircraft landing right over your head, exciting! Glorietta Bay has a small beach area and children’s playground you can see the bridge from here, and it has nice views of the city. There is a ramp to launch boats from so it is a popular area for sailing and kayaking. If you fancy a break from the beach there is a great public golf course near Glorietta Bay, it has 18 holes and is surrounded by a dramatic backdrop. Although thought of as an island, Coronado is actually a peninsula connected to the mainland by Silver Strand Boulevard, which leads to Imperial Beach. From Silver Strand State Beach you can swim in the Pacific Ocean and the San Diego Bay and with 7 miles of seashore there is a lot of sandcastles to be built! It is also popular with kite boarders, is lifeguard patrolled and has fire rings. With a picnic area, toilet and shower facilities and space for RV camping this beach has a lot to offer. The Navy SEALS are based here and can often be seen training nearby. Coronado is great for cycling and has a lot of cycle and pedestrian paths. A good one is the 9 mile Silver Strand bikeway. Starting at the ferry landing it goes all the way to Imperial Beach, and is a fairly easy, flat ride. With beautiful scenic views you can go at your own pace and explore the area. If all that beach activity leaves you needing refreshment there are some great places to eat and drink. Coronado has some nice spots to head to for breakfast or brunch. Tartine and Claytons are very popular with locals; I recommend the house made granola if you visit Tartine. The Coronado Brewing Company’s microbrewery is a couple of minutes cycle from the ferry landing, so you should definitely stop by here! A selection of beers with cool names such as Hoppy Daze and a tasty menu wiil get you refuelled and ready to get back on your bike! With such a variety of beach activities to do on such a stunning coastline this is Southern California at its best! Further reading: If you plan on visiting Southern California sometime, take a look at our list of top 10 things to in San Diego to see what you’ll be up against.